These four figures are delights of color and design.There is simply nothing wrong with them. Robin Hood is a perect head sculpt capturing the essence of the Errol Flynne version of the character. Will Scarlett utilized a headsculpt also used for mego Galahad and Palitoy Zorro but recycling is forgiven when it’s such a nice job. Little John is no Alan Hale Sr. but is a lively interpretation. Of the four, Friar Tuck is the most commonly found. 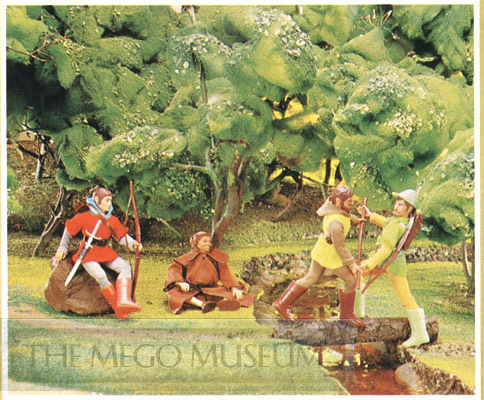 Robin hood figures came on both Type 1 and 2 bodies, most commonly Type 1.